Overall, I classify this under the pretty healthy food category. It was the first time I’ve cooked with garlic pepper and really liked it, a seasoning I’ll definitely look to use in other recipes! 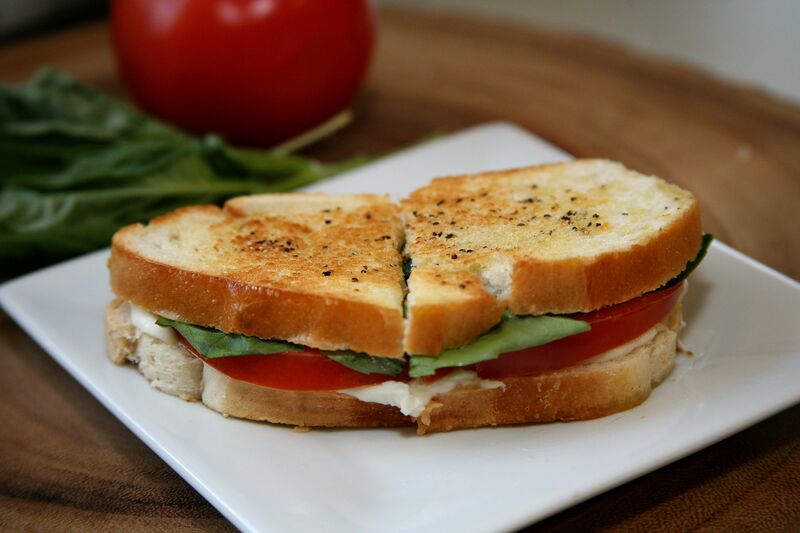 Once you have your ingredients gathered, set aside two pieces of bread for each sandwich you are making. Using the garlic, rub it against each side of each slice of bread (or you can spread minced garlic over the inside pieces of bread). 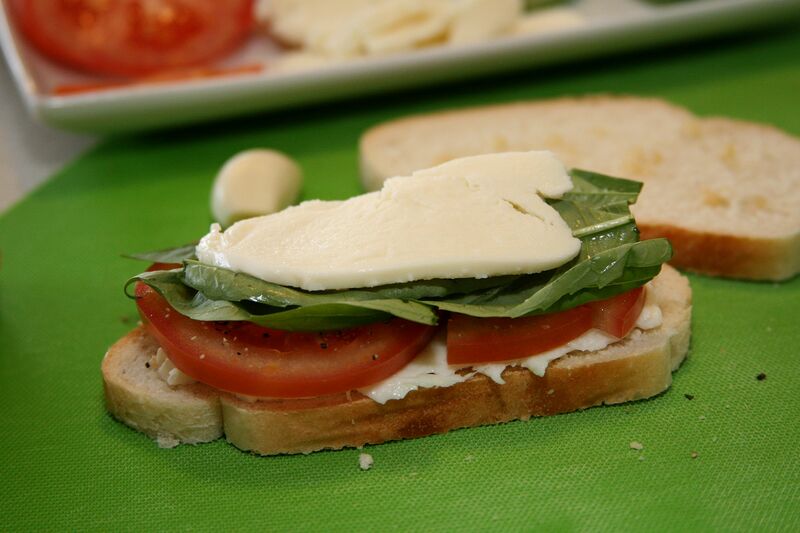 Next, top one slice of bread with mozzarella cheese and tomatoes. 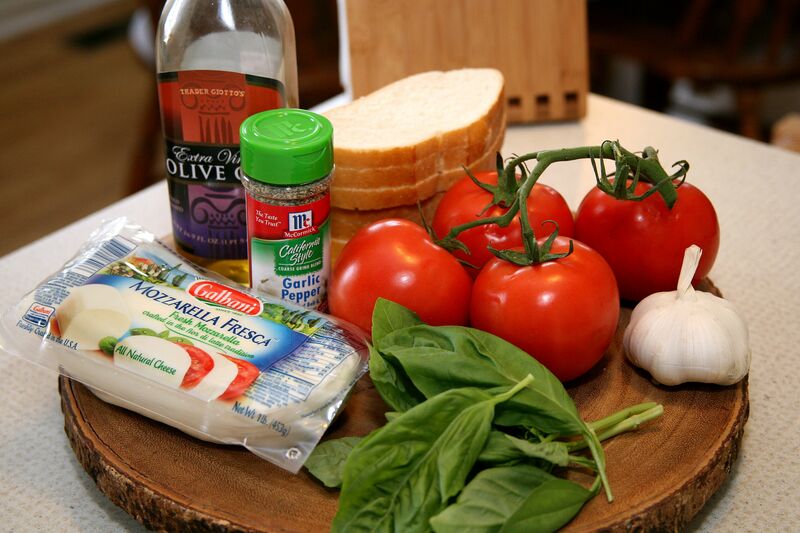 Sprinkle some garlic pepper over the tomatoes and top with fresh basil and another layer of cheese. 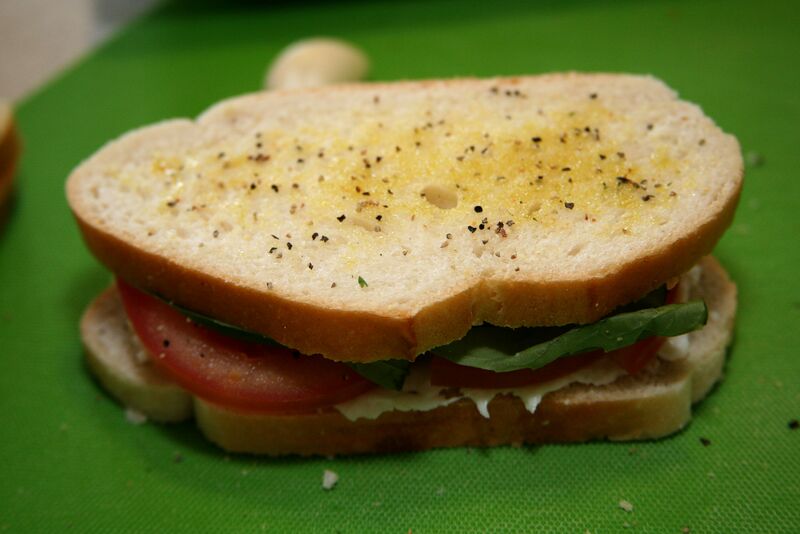 Complete your sandwich by placing the other slice of bread on top and brushing it with olive oil. Sprinkle a bit more seasoning on top and add it to your skillet heated with one teaspoon of additional olive oil, brushed side down. Brush olive oil on the slice of bread facing up at this point and add seasoning if desired. Cook for just a couple minutes on each side allowing the bread to brown and the cheese to melt. I will share the recipe I found for this sandwich, but will be honest in telling you I didn’t really follow it. For something like this it just depends on how many sandwiches you are making, personal preference for amounts of each ingredient and watching it closely as it cooks! Now, my step daughter wouldn’t try this after seeing the tomatoes and basil…she really missed out! It’s a delicious sandwich! My husband approved right away and we both really enjoyed the sandwich! I made potato soup later in the day for dinner and I think I’ll make this to go with the soup next time! Hope you all find the time to try it out and enjoy! Rub both sides of each bread slice with garlic. Top each with a fourth of the cheese and half of the tomato and basil. Sprinkle each with 1/8 teaspoon of the seasoning; add remaining cheese and bread slices. 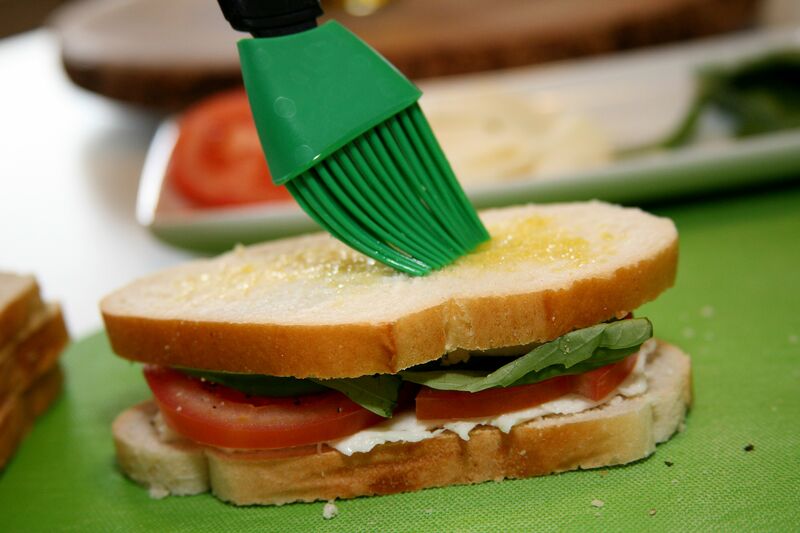 Brush tops of sandwiches with oil and sprinkle with seasoning. Heat 1 teaspoon of the oil in a large skillet over medium heat until hot. Place sandwiches, brushed-sides down, in skillet. Cover and cook 2 to 4 minutes or until golden brown and cheese on bottom of sandwich begins to melt. Reduce heat to medium low. 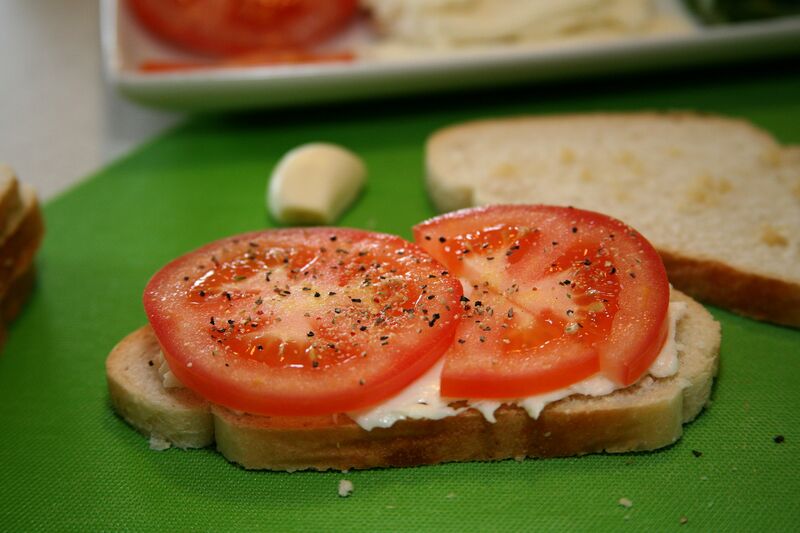 Brush tops of sandwiches with remaining oil and sprinkle remaining seasoning. Flip and cover to cook another 2 to 4 minutes or until golden brown and cheese is melted. Jordan Gray posted a link to this so I checked it out, but I definity want to try this sandwhich! We have a huge basil plant every year and I’m always looking for things to use the basil in. This is perfect! Thanks!